After identifying the considerations most relevant to a particular community, the developer may prepare an outreach plan to address community concerns and build project support. Sheep grazing near the Shiloh Wind Project in Solano County, California. Photo courtesy of PPM Energy. 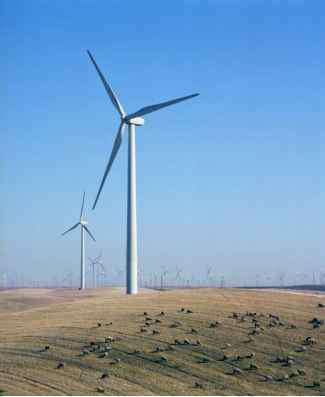 have concerns about a wind project, those concerns usually focus on one or more environmental or land use issues. This section discusses the role of the developer in communicating with various audiences, how to convey a message, and when and where to conduct public outreach activities. "Know your audience" is the key to any phase of siting and permitting. Whether the developer is facing a regulator, a neighborhood, or the media, it is important to communicate effectively with those interested in the project. The most successful wind energy projects are those in which all stakeholders feel a sense of ownership and empowerment. The challenge is to promote this inclusiveness to gain allies without losing control over the process and the developer's message. During the siting process, the developer will get to know the local, regional, and state political issues and players. The developer may pick a spokesperson who is knowledgeable about the details of the proposed project and who will be available to answer questions. Some developers find it helpful to consult with a public relations specialist to create a public outreach plan and schedule. 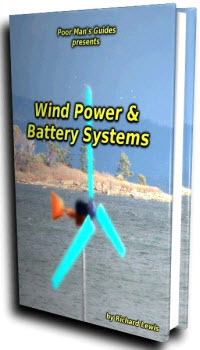 Factors to be weighed in deciding whether or not to hire such a consultant include the location, complexity, and schedule of the proposed project, as well as any particular concerns about wind energy projects or positions held by regulators and permitting authorities, the community, abutters, and the media. 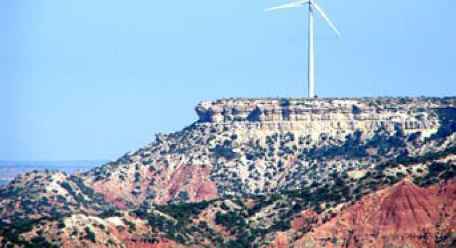 Wind turbine at the Red Canyon wind energy facility in Texas. Photo courtesy of FPL Energy. Where possible, the developer should forge positive relationships with government officials. Public officials usually want to know about proposed developments before the general public. Public officials often can alert the developer to more obscure obstacles or concerns that might be addressed before the project is announced. Minor project adjustments may be made in response to concerns voiced by public officials. Although officials may not agree with every aspect of the project, gaining their respect through proactive communication is worthwhile. The developer should explain how the project will promote the positive impacts of wind power, such as energy generation with no air or water pollution, utilization of domestic sources of energy rather than reliance on foreign imports, increased energy security and independence, benefits for the municipality including an increased tax base and modest increases in local jobs, and creation of a potential tourist attraction. The socioeconomics discussion in Section 5.7 provides additional information regarding increased tax base and local job creation. Many local officials want to be identified with local development projects and can become valuable allies in presenting the project to the community. It is usually easiest to develop such relationships with local officials, although the developer should approach state and federal officials as well. The developer may coordinate with government officials early in the process to communicate with the public during the development of a proposed project. After local officials and regulators have been briefed on the project, the developer might offer to meet with neighborhood and community leaders. The best way for people to hear about a project is directly from the developer, before any opposition can spread misinformation about the project and its potential impacts. The developer may consider distributing leaflets in an area or sending bulk mailings from the local post office. Once the community knows the developer's plans, the developer may consider consulting with neighbors and abutters to give them an opportunity to comment before formal proposals are submitted for review by regulators or permitting agencies. 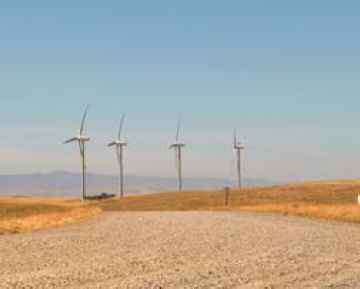 Wind turbines at the Highwinds wind project in California. Photo courtesy of FPL Energy. Most permitting agencies will hold public meetings or hearings at the beginning of the permitting process to educate the public about the project, the permitting process, potential issues, and opportunities for public involvement. Some agencies may hold meetings or workshops in the community to allow meaningful public involvement. Permitting statutes and regulations usually provide an opportunity for written comment. The developer may also consider hosting a series of public meetings to educate the public, government officials, and the media regarding the project before and during the more formal permitting agency process. Some regulatory requirements may include a public meeting or hearing. These meetings could be small focus groups, facilitated planning sessions, or open houses. The developer may also want to consider hosting educational programs and other community-based functions. S Start with the most important points first. These may include the environmental benefits due to the displacement of fossil-fuel fired resources. S Listen carefully to issues and potential concerns. First impressions count, so be attentive and thoughtful. S Answer each question to the extent possible. Don't be evasive. 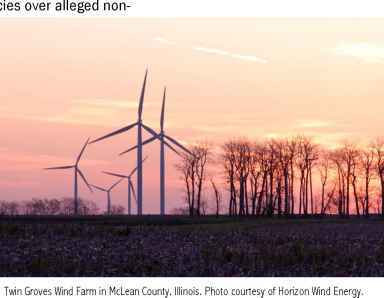 Remember that most communities don't have experience with wind energy developments and may carry misperceptions about the impacts of a wind energy project. S When it is time to respond, speak clearly and honestly. S Maintain a calm disposition at all times. S Responses should be brief (1-2 minutes). Additional information can be provided in a side discussion after the meeting or in response to a follow-up question. S Don't read from a script. If you don't have the answer or a task requires consideration, say "I don't know but I'll look into it and get back to you" or "we will consider that." Then follow through on this commitment in a timely manner. S Ask people for their contact information so that you can respond to their inquiries and do so promptly. 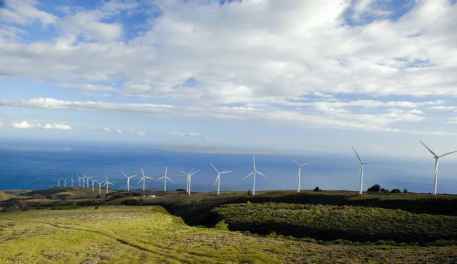 Kaheawa Wind Power turbines in Hawaii. Photo courtesy of UPC Wind. Meetings held at times that are convenient for the audience (weeknights or weekends) are usually the most inclusive. The location should be suitable - with enough seats and acoustics that allow everyone to be heard. To convey important information, the developer could use a PowerPoint™ presentation or large boards displayed on tripods. 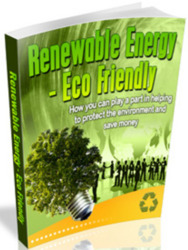 It is often useful to prepare fact sheets, frequently asked questions, and other handouts. The developer may consider issuing press releases to the media at key points during the process. A simple website can be a useful communication tool. If used, the website should be kept up-to-date, and could include links to public documents and a calendar with meetings, events, comment periods, and deadlines. The website should also include an email address or telephone number of the developer or the public relations representative for members of the public to ask questions and provide feedback. The developer may consider taping public meetings (announcing at the beginning that the meeting is being taped). Formal transcription services involving stenographers often set a more aggressive tone, although having an exact transcript can be helpful later in the permitting process. The developer will often maintain a database of attendees at public meetings, questions issues raised, and responses to questions and issues. Once the developer has received approval for the project, public outreach should continue throughout the life of the project. A telephone number should be available to members of the public who wish to call with questions or concerns. The developer should consider developing a complaint resolution system and designating an independent ombudsman to hear complaints. This will avoid, or at least narrow, unnecessary hearings before permitting agen compliance with permit terms and conditions. While unlikely to appease everyone's concerns and issues, the developer will likely have more success with an approach that is proactive, prepared, credible, and resourceful. The developer must know the audiences, educate them about the project, listen to their concerns, and solve problems creatively. The process won't always be smooth, but the developer will decrease permitting time and effort by commencing public outreach early in the process and continuing throughout the life of the project. Creating project websites and telephone hotlines can be useful communication tools.